What you carry into the field makes all the difference between loaded down and efficiency. As modern hunters we seem to have an awful lot of stuff to tote into the field these days. We have all become what pioneering naturist Aldo Leopold termed “gadgeteers.” And why not? Modern hunting and outdoor gear is nifty stuff, makes us more efficient and helps increase our enjoyment of the outdoors. When I was young I carried everything needed for all-day hunts in the pockets of my surplus Army fatigues. But the key word was young. I was immune to suffering, and didn’t really care if I got lost, so long as the weather wasn’t life threatening. And I suffered a lot. At 50 I try to avoid discomfort whenever it is under my control to do so. 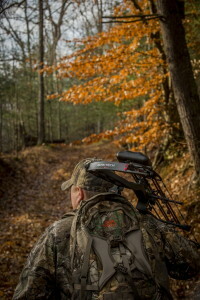 This allows me to concentrate wholly on hunting, and not comfort, where I am or the consequences of getting hurt or lost. Many of us are in the midst of bow hunting as I write this (no, I haven’t gotten my elk yet, but I’m closing in), and rifle seasons are right around the corner. Which raises the question of what you are carrying into the field and why. There are two basic approaches to this, based largely on where you are hunting and how you approach the sport. The where means accessible country verses inaccessible, generally a matter of how far from your camp, house or vehicle you venture. How is a matter of whether you’ll see you’re camp, house or vehicle well before noon, or if you typically stay out all day. I moved to north Idaho for a reason, mainly because I have hunting literally right out my backdoor, as well as trout fishing close to home. It’s quite common for me to roll out of bed and step out my front door, drive my truck or ATV 10 or 15 minutes before starting out or climbing into a tree-stand. During these hunts I’ll inevitably be back to my house for lunch. In other circumstances, maybe chasing birds with my dogs, or scouting, I’ll be in and out of my truck all day, but never away from it for more than a couple hours. I don’t need a big pack for this. A fanny is perfect for such outings; something like Bad Lands Nano or Alps Outdoorz Pathfinder, as examples. All I really need is a basic GPS unit, and XMaps chip if I am hunting around private lands (normally to mark discovered highlights, such as elk wallows or a hidden spring, not necessarily to find my way), a light rain suit if precipitation is in the forecast, a sharp knife, hunting licenses, compact flashlight and basic water bottle. If I’m hunting and I get something down, it’s easy enough to return home for pack boards, rope, sharpening stone, meat bags, cameras and the like. In these cases I want to travel light and cover some ground, knowing if weather turns nasty, I forget something or am successful, my truck and home are never far away. Why weight myself down under these circumstances? In other areas and circumstances I plan on being out all day. This might include hunting or fishing in remote areas where the hike starts and ends in the dark of morning and evening, in rougher terrain where if I get into, say, some bugling bulls I may want to stick around for an evening hunt instead of schlepping in and out and wearing my legs out, or when weather is potentially life threatening (or at least highly uncomfortable) and I must plan for a worst-case scenario. In this case I’ll opt for a larger daypack and fill it with a few more items to keep me safe and comfortable under any foreseeable eventualities. Bad Lands’ Summit or Alps’ Pursuit X are good examples of packs suited to such forays. I break contained gear into six basic categories: navigation, first aid/safety, weather-related clothing, meat care, hydration and hunting/fishing essentials (depending on what I’m up to). While I’ll always toss in a GPS unit any time I’m hunting, in rougher backcountry I back this up with a reliable compass like those from Silva, and spare batteries for the GPS. The compass is added because electronics can break down, get wet and fritz out and so forth. You should have backup if in big country. First-aid and safety items are a no-brainer, compact first-aid kits from Adventure Medical always a welcome addition to any pack, as well as reliable fire starter, including accelerant (like Fire Paste or Wet Fire), waterproof/windproof matches, and a basic “space blanket” to keep you alive if you must spend the night out unexpectedly or to act as shelter in pouring rain. Based on weather I also generally carry extra clothing pieces. The most basic is rain gear, obviously. Just yesterday I rode my ATV an hour into backcountry closed to truck traffic, began hunting, and was overtaken by an unexpected downpour. Had I not had my Sitka Gear Gore-Tex raingear in my pack it would have been a very miserable, hypothermic ride back to my truck. Instead I was able to continue hunting and actually discover fresh elk sign and a new place to hunt in the coming week. During colder seasons I normally stash a backup insulating jacket, a puffy Primaloft or down liner that provides lots of warmth on demand but stuffs into a tight ball so it doesn’t occupy a lot of pack space. Such a jacket has saved me from misery when an unexpected front pushed in and temperatures plummeted 30 degrees or I became wet. I always carry a spare pair of socks in a Zip-Lok bag. Laugh if you will, but a dry pair of socks after flooding your boots during a creek crossing is a godsend. Meat care is a very important component of the all-day pack. Taking care of meat is highly important to me, as my wife and I depend on it for yearly subsidence. If returning to the truck is infeasible I’ll carry meat bags (especially if it’s warm and insects are still active), rope for hanging quarters, two sharp knives (so I won’t have to stop in the middle of skinning while quartering an elk) and a compact diamond steel sharpener. 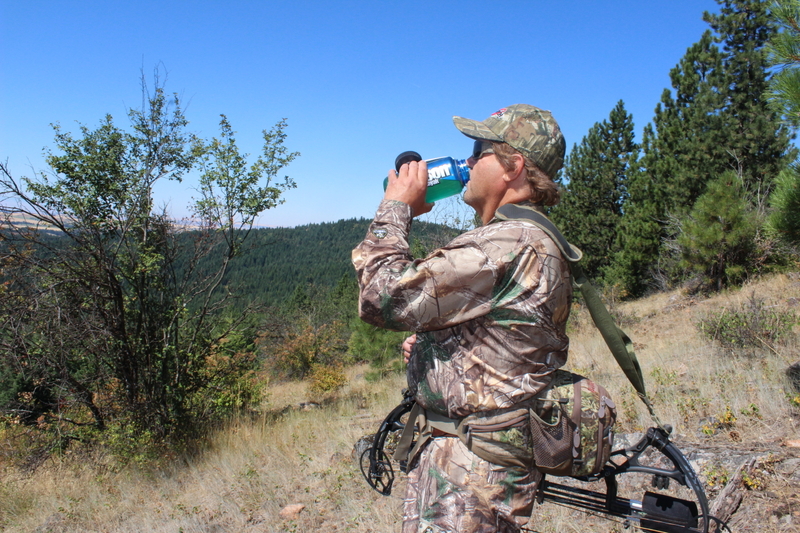 Hydration is also vitally important while hunting hard, even if it’s cool outside. Hydration bladders make a lot of sense, becoming integral to most modern packs, allowing you to tank up for all-day ventures and eliminating game-spooking sloshing. In north Idaho, where springs and creeks are in nearly every canyon, I find it easier to carry a filtration water bottle like those from Katadyn or Lifestraw, allowing me to provide safe drinking water on the fly. Finally, there is hunting-related gear specific to the endeavor. While bowhunting, for instance, I’ll carry a few extra broadheads and spare blades, a spare release, a few extra nocks and small-game points. While rifle hunting I’ll pack a handful of spare cartridges and a scope-cleaning cloth. Today I always carry a quality rangefinder with capabilities suited to my weapon of choice, i.e. like Leupold’s RX 1200i while bowhunting, something with longer capabilities while shooting a firearm. In addition, if there is any chance I might stay out overnight, I don’t hesitate to stuff a lightweight sleeping bag (something made for biking is best), feathery one-man bivy sack, compact backpacking stove, titanium cup and dehydrated meal. It’s not uncommon, for instance, if I’ve hiked well into rough-and-tumble country and gotten into a hotbed of bugling elk on an evening hunt to simply stay put so I can maintain contact and wake up to continue the chase come morning. Five extra pounds of extra gear makes all the difference between comfort and misery in these scenarios. 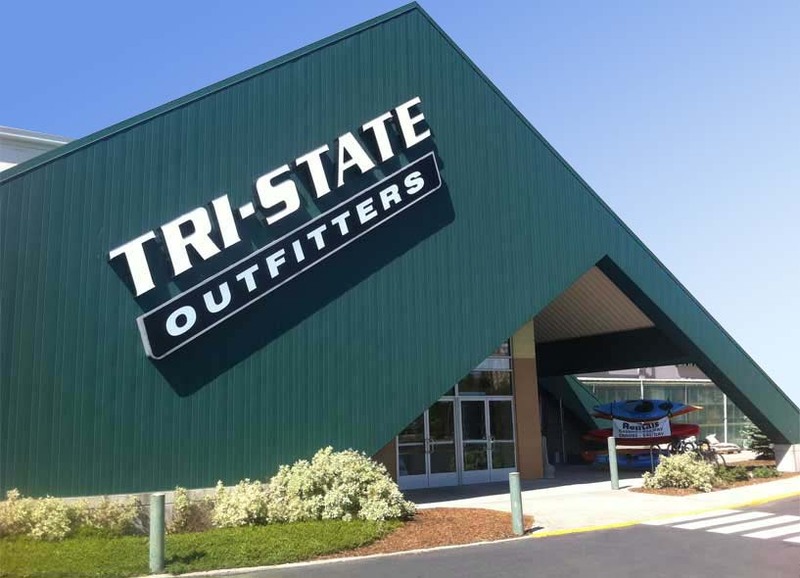 No matter your hunting area or hunting plans, everything needed to assure you have all the right gear—from the perfect pack to the smallest details such as fire starter—can be found at an area Tri-State Outfitters (Moses Lake, Washington, and Coeur d’Alene, Moscow and Lewiston, Idaho) or Sportsman & Ski Haus (Kalispell and Whitefish, Montana). Their expert staff can also help you choose the right gear for the type of hunting you do most, assuring your fall outings are as comfortable and successful as possible.